I’d always heard about trading halts, but never had the bad luck to experience one. 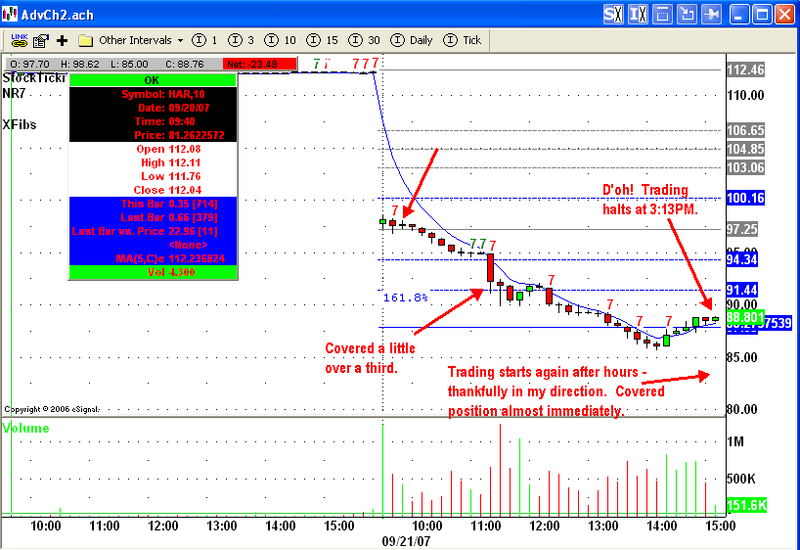 I entered HAR early on in the day and it gained momentum down throughout the day. I covered a third around the Fibonacci extension and put in a loose stop hoping to cover at the close. It had another leg down and it turned into my best trade ever in terms of dollars. Then Eyal noticed some strangeness around 3:13PM. Eek! It had halted! I searched around trying to figure out what was going on. Here’s NASDAQ’s page of current halts which confirmed it. Dang. This is the first time I’ve experienced this and it was no fun. Luckily I had scaled out and my position was relatively small. There was also lots of negative news coming out (or at least it seemed negative to someone who completely ignores fundamentals 😉 ). After my “cover at market close” order triggered and failed just before the close I was fully expecting to get burned – a sleepless weekend followed by a big loss at the open on Monday. Or a windfall, but hey, these big surprises are why I stopped holding overnight – at least I that’s what I thought! Very luckily, HAR started trading again at 4:02PM – gapping down, thank goodness. I covered pretty quickly. Whew. Any other traders out there get caught by this? Eyal did. Those halts are scary. Congrats on the record profit. How many R did you clear? Thanks for the comment, Mike. I cleared 8.4R on the trade.